FELA! is a Tony Award Winning Broadway sensation and YES... 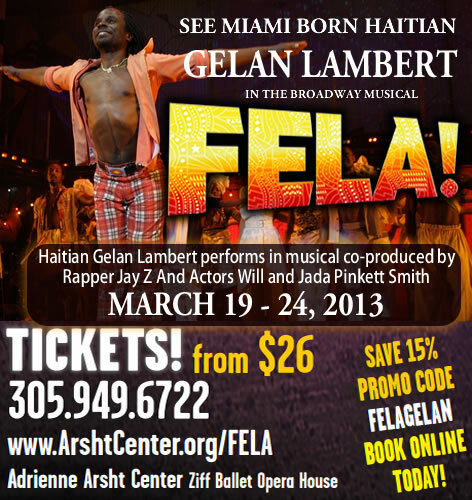 There is a Haitian in it... See Haitian Tap Dancer Gelan Lambert take flight in FELA! live in Miami at the Adrienne Arsht Center, March 19 - 24, 2013. Haitian Gelan Lambert in Broadway Musical FELA! In 1995 as a Senior at New World School of Arts in Miami, Gelan won first place - National Foundation for the Advancement of the Arts (NFAA) now called YoungArts. Gelan received the National Presidential Scholar Award and went on to study at Julliard. The FELA story is in many ways, our story. So many in our community have faced the struggles Fela Kuti championed. So many of our talented Haitians have brought the beauty and the awesome power of dance and music to share our story. I was blessed in many ways to grow up in Miami's Haitian community. My journey from Miami Haitian roots motivated me to work hard. What a great honor for me to be apart of such an inspirational musical, that has taken me around the world and to critical acclaim on Broadway! I look forward to meeting you all in Miami! This Week! Do Not Miss It! From a team of producers including Jay-Z and Will and Jada Pinkett Smith comes FELA! Directed by Bill T. Jones, this provocative hybrid of dance, theater and music explores the extravagant world of Afrobeat legend Fela Kuti and has become an international sensation having been performed in three continents. A triumphant tale of courage, passion and love, FELA! is the true story of Kuti, who created a type of music, Afrobeat, and mixed these pounding eclectic rhythms (a blend of jazz, funk and African rhythm and harmonies) with incendiary lyrics that openly attacked the corrupt and oppressive military dictatorships that rule Nigeria and much of Africa. Featuring many of Fela Kuti's most captivating songs and Bill T. Jones's visionary staging, FELA! reveals Kuti's controversial life as an artist and political activist and celebrates his pioneering music.